THESE ARE OUR RULES. YOU MUST READ AND UNDERSTAND FOR ANY SERVICES DONE HERE. Shop Minimum - None! All tattoos are charged for what they are worth! Deposits are non-refundable and non-transferable. 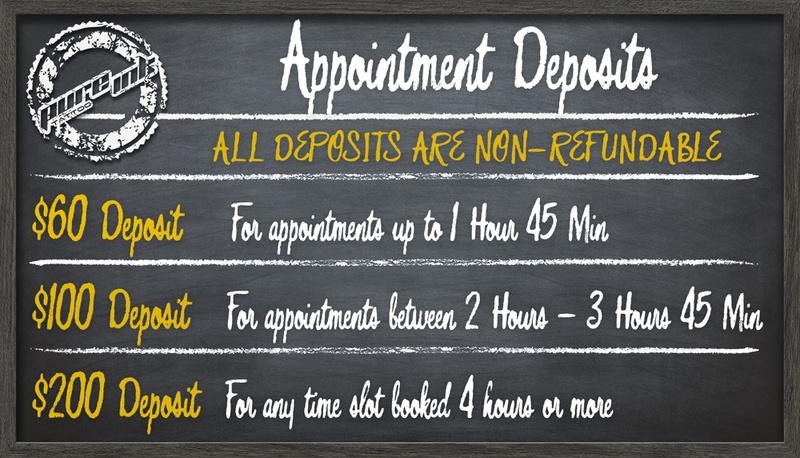 Deposits are retained to schedule appointments. Please understand that if you miss your appointment or do not call to cancel or reschedule 48 hours prior, then you forfeit your deposit. Also understand that if you forfeit your deposit by not calling or showing up you will be required to pay for your next session in full at the time of booking. If you change the original design from what was discussed when the appointment was booked you are also subject to losing your deposit. Our artists work hard, please don’t waste their time or effort! You should plan to arrive 30 minutes early on the day of the appointment so you can review your drawing. On occasion the artist may try to have the drawing completed at an earlier date however this is NOT a guarantee! If you chose to bring your child into our establishment, please bring someone else with you to care for them if you are getting tattooed. We are not responsible for your children or their actions. Noise is to be kept to a minimum so that way our artists can concentrate in comfort. If there is running and screaming you will be asked kindly to take your child out of our establishment. Most of us here at Pure Ink are parents ourselves, so we understand how children can get sometimes. This is why we ask you to keep them on their best behavior when visiting Pure Ink. If you are loud, obnoxious or disrespectful to any of the staff or clients that are in our establishment then you will be asked to leave and not return. There is no running around, disturbances or horseplay in our facility!!! This is a professional and courteous establishment. Please have the understanding and respect when entering Pure Ink Tattoo. Thank you for following our rules and policies. All clients will be asked for identification prior to starting their procedure, pursuant to NJ State Sanitary Code Chapter VIII Body art Procedures N.J.A.C 8:27-1 ET SEQ. All identification will be held digitally for a period of 3 years as per state guidelines. NO ID MEANS NO PROCEDURE! ABSOLUTELY NO EXCEPTIONS. For clients under 18 years of age please read our requirements stated below to determine what New Jersey State Law requires. Requirements - Here are the rules! ADULTS: To be Tattooed/pierced or have jewelry inserted, you must be at least 18 years old. You must be at least 16 yrs. old to be tattooed! Infant – 13: We will only pierce the earlobe. Nothing else. 16+: In addition to the above, we will also pierce a tongue.